Having an alias can be a handy tool, especially if one’s deeds are perceived as less than honorable. Lubbers are guilty of the nom-de-crime permits the holder to wantonly commit all sorts of offences while maintaining a level of anonymity. History is replete with examples of this technique utilized by criminals “including horticulture” horticulture, and authors. One’s personal value system will be needed when making an assessment as to the nobility of the duel identity-holder’s motivations and actions. Examples of people using this method include the desperado Billy the Kid and the short story writer O. Henry. O. Henry’s real name was William Sidney Porter which helped hide his background as a convicted embezzler during his early writing career and Billy used several fabricated names in an unsuccessful attempt to evade his pursuers. Even a local insect has multiple identities, both with common and scientific names. The much despised Georgia Thumper, as it is known in the panhandle and other Florida locations, is entomologically know as both Romalea guttata and Romalea microptera. The double designation is the result of an entomological reclassification which was not widely accepted in the profession, and had no effect on this insect’s behavior. Most frequently identified as an eastern lubber grasshopper, it is unable to escape its reputation as among a gardener’s least wanted pest. Initially, this insect appears as one more of the benign little creatures which inhabit the area. Its eggs are about a quarter inch long and laid in neatly arranged clusters which consist of rows placed parallel to one another. Usually there are 30 to 50 eggs in each grouping. All indications are the female grasshoppers prefer mixed broadleaf tree-pine habitats with intermediate soil moisture levels as incubation sites for their offspring. Too dry or too wet will have a negative effect on the hatch rate. Females each produce three to five egg clusters annually with a two week interval between groups. The eggs require a cool period for three months and then they will hatch, typically in the morning, when temperatures warm the soil. The immature eastern lubber grasshopper’s appearance is quite different than the adults which are bright and easy to spot. Nymphs typically are black, but with a distinctive yellow, orange, or red stripe located the length of their back. Its face and other segments may contain reddish accents. Normally there are five developmental stages or instars, though occasionally six may occur. As they mature, the nymphs change slightly in appearance as their wings develop and they grow noticeably larger. During the early developmental phases, the little grasshoppers have a delicate cartoonish appearance. They have large mournful eyes and cluster in groups as if trying to decide where to search for their missing mother. They quickly grow out of the cute phase and quickly earn the need for multiple aliases. It has been said by August they are as big as cats and eating like market hogs, and eat they do. Eastern lubber grasshoppers have a wide host range of host plants. At least 100 species from 38 plant families containing shrubs, herbs, broadleaf weeds, and grasses are on the menu. Allegedly their mouthparts are best adapted for feeding on broad-leaf plants not grasses, but they will consume it if other selections are not available. If they encounter crops they will damage vegetables, some field crops such as peanuts and field corn, fruit trees and ornamental plants. No matter the name used, it always has a negative implication. It is never a good day when these nuisances stop by for a snack. 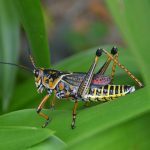 To learn more about managing the eastern lubber grasshopper population, contact the local UF/IFAS County Extension Office. Click here for contact information.